The Baby Works™ Baby’s 1st Pillow provides maximum support to help your baby sleep comfortably. 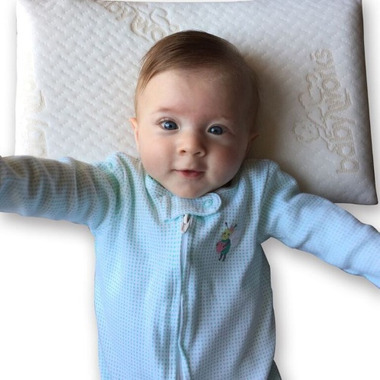 The airflow treated open-cell memory foam is specially made to prevent flat-head syndrome by absorbing and distributing the weight of baby’s head evenly. The Baby’s 1st Pillow is perfect for use on the floor, bouncy seat, car seat or swing! 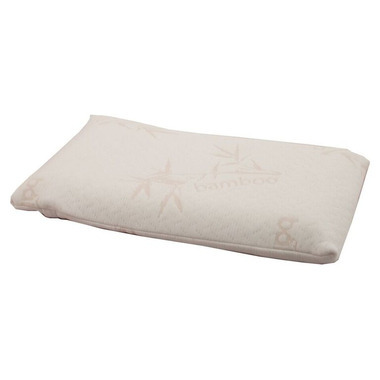 As part of Baby Works™, the Baby’s 1st Pillow comes with a hypoallergenic fitted pillow case, made using rayon from bamboo fibers, which is soft and gentle, keeping the pillow cool and comfortable. Airflow treated open-cell memory foam is comfortable & breathable! Perfect for use on the floor, bouncy seat, car seat or swing! Great pillow! Purchased for my 3 month old as he was starting to develop a slight flat spot. We use for naps (so I can monitor) and if he's playing on his back. Excellent product! I'll start using for bedtime when he gets a bit older. Perfect size for an infant! My fourth month old son loves this pillow! He naturally runs warmer and at night he can overheat fairly easy but since having this pillow he's sleeping soundly and staying cooler and comfortable! He loves this! I'll def be buying the toddler one! My son loves this! He's a colic and he tends to run on the warmer side this pillow is a dream! He enjoys it and he dosnt get so hot!!! I love how easy it is to clean! Thanks so much I'll be sure to get the toddler one!! I love this pillow. I was looking for something thin for my 17 month old. Most I came across were too thick and too fluffy. This one is perfect. Its a great size and firm. I liked it so much I bought a second one. I would definitely recommend this as a starter pillow. I plan on buying the toddler size one when he gets bigger.